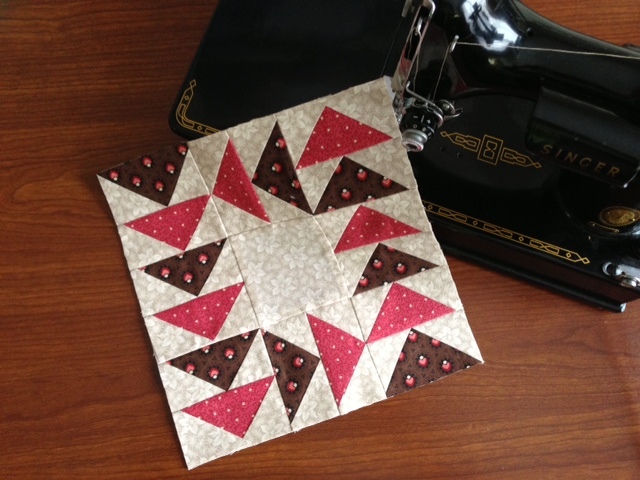 February | 2013 | Quilting my way through life! but it has been such fun!!! These are the blocks for Day 8. 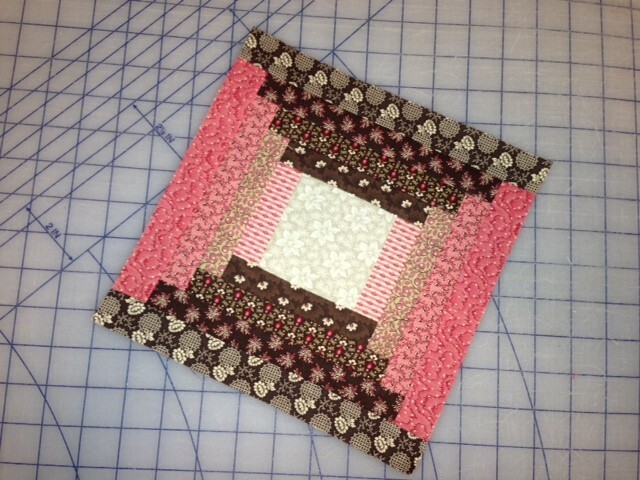 I like the added dimension that the pink stripe fabric gave this block. I decided to turn every other block to change the direction of the stripes. There is a mistake in this pattern. 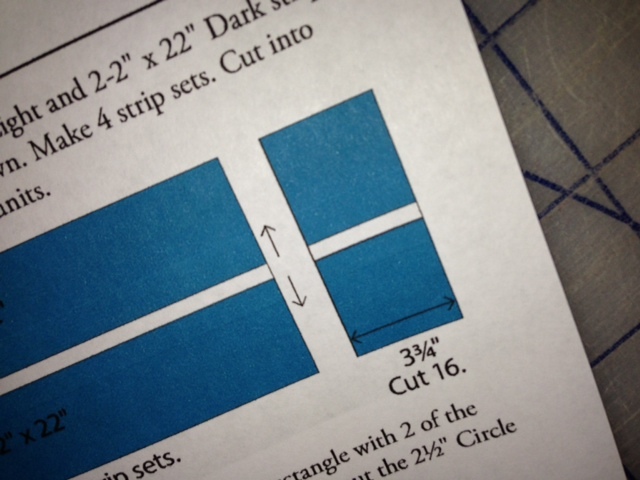 When you go to slice segments off the strip set, you should cut them 1-3/4″ (not 3-3/4″). Easy mistake, 3-3/4″ is the width of the strip set. Fortunately I was concentrating when I got to this step. 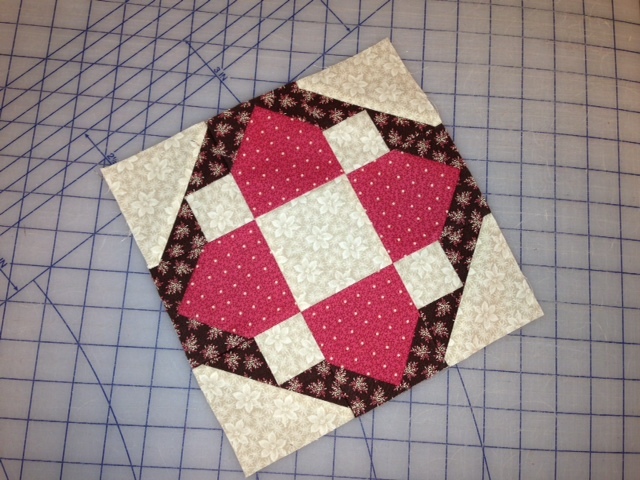 Not my favorite block in the sewing, but the finished product I think is stunning. 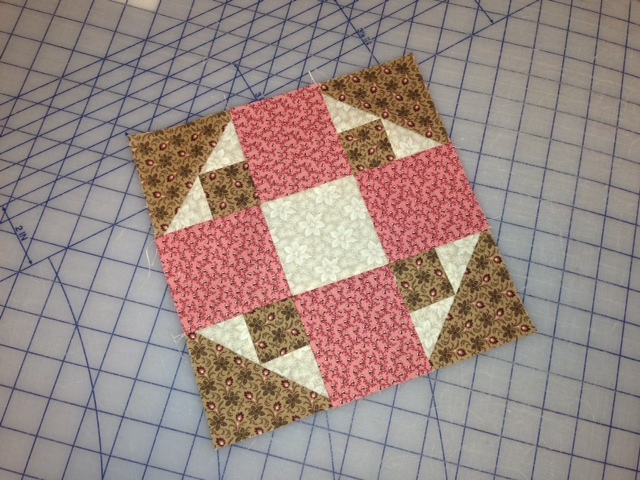 As a tip, I used my walking foot to sew the squares together to finish the block. 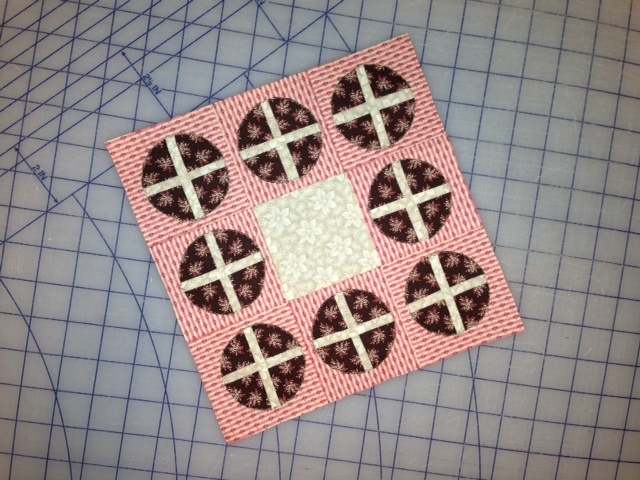 The circles are a bit bulky to sew over. With my regular foot the fabric wanted to slide to the side. The walking foot sewed right over the bulky portions & kept my seams straight. I sewed this one yesterday on my featherweight machine. See the accuracy of those points? I’m going to keep my featherweight out and use it more often, it was fun! 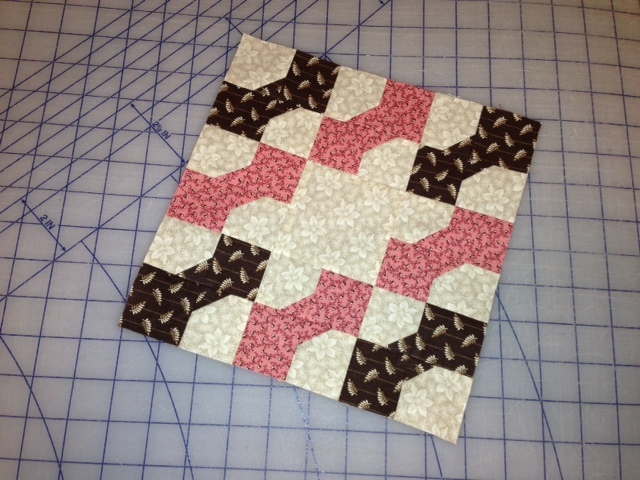 This block was easy & fun, my two favorite adverbs when sewing. I’m accumulating quite a stack of beautiful blocks here. These are the blocks of the day. and these blocks to work on. so just in case I was snowed in, or if I got the chance to sew I could. I kind of have to re-teach myself to use them. You know, where is that pesky scant 1/4″? How do I rewind a bobbin if heaven forbid I run out? I can’t say this for all of my sewing all of the time, for sure. I was very pleased with this progress however. I also found it very nice that the pattern actually told me what size this piece was supposed to measure at this point, thank-you! 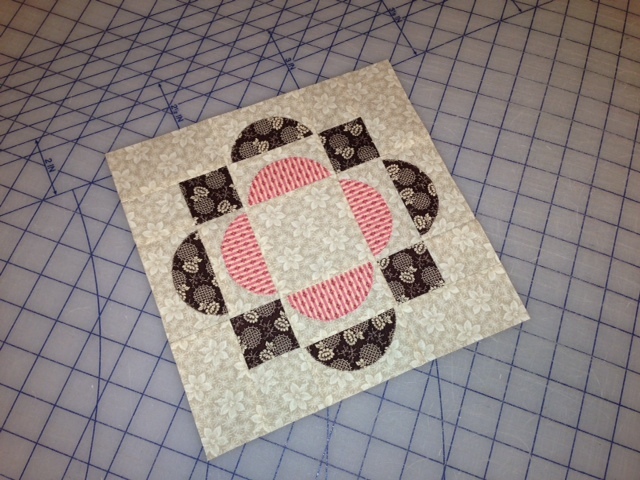 Block #4 by Primitive Gatherings. 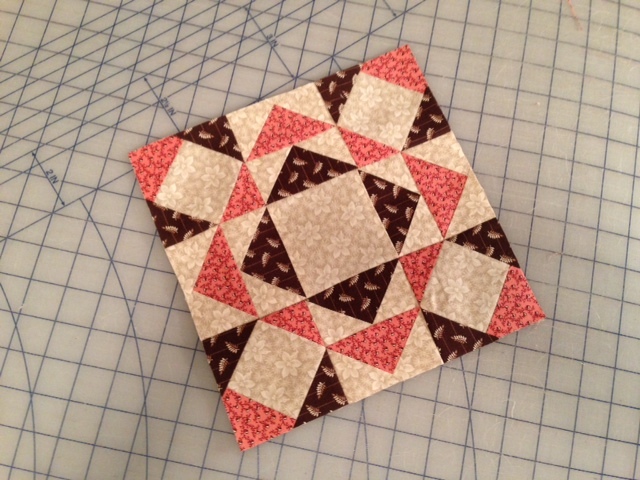 This block turned out so nice…I love it! Block #19 by Me & My Sister. This block was a breeze too. I wouldn’t mind making more of these either. Block #13 by Malka Dubrawsky. I had to re-sew two of the seams, one of them twice to make it satisfactory to me. I had to laugh when I was pressing it and trimming the threads before I photographed it. It reminded me of a funny story that my MIL & husband tell of my SIL and her 4-H pancakes. Anyone take “Milk & Eggs in Your Meals” for a 4-H project? Back in the day, for the show, you had to make 3 pancakes EXACTLY the same size and present them on a plate to the judges. and then you were awarded a ribbon. Well, that morning was very stressful to say the least, said SIL could not get 3 pancakes the same size to save her life, so she got out a pair of scissors and trimmed away the excess! I can’t image the judges didn’t notice cut edges and I never did hear what color the ribbon was for those pancakes, but it makes everyone laugh whenever we are reminded of it! This is what I thought of while I was trimming the threads. Too bad I didn’t think of the pancake story before I ripped out those seams. I probably could have saved myself some time and just trimmed something instead. Here are the patterns for Day 6. I love the fact that I have strips cut of background fabric that are just the right size for slicing off another couple of rectangles, a few more 2″ squares, another 3-1/2″ square, etc. 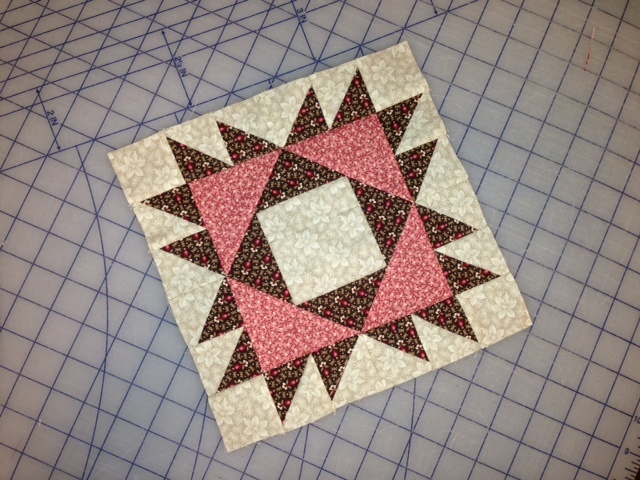 Block 12 by Laundry Basket Quilts. Block 30 by Kathy Schmitz. Block 27 by Lauren & Jessi Jung. Each one is prettier than the next, don’t you think? 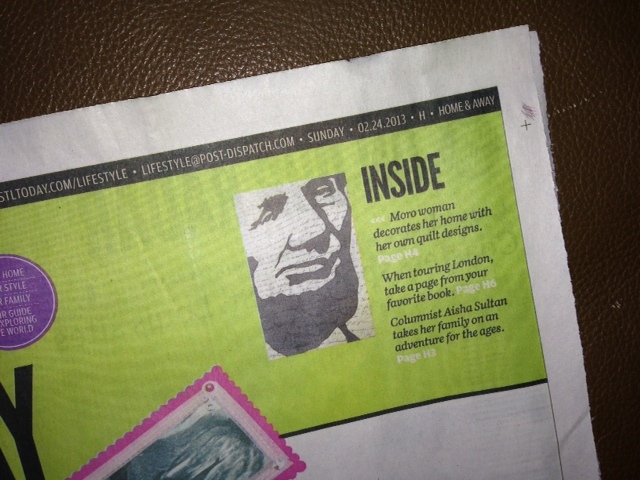 gracing the cover page of the St. Louis Post Dispatch’s Home & Away section!!! Last month I was contacted by Diane Raab Wiggins, a writer for The St. Louis Post Dispatch. that I had a unique Abraham Lincoln quilt/pattern that would tie in nicely with President’s Day. Diane wanted to know if she could come by and interview me and have me, my quilt, and our home photographed for the Post’s Home & Away section. 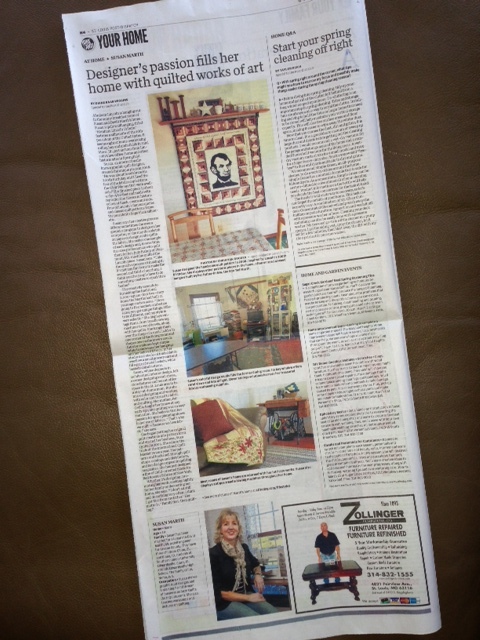 It would be an honor to grace their paper with my quilts. then the photographer, Christian Gooden, Gooden@post-dispatch.com, showed up with his camera. 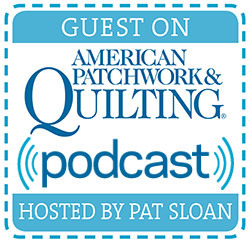 I learned his mother, now living in Pheonix, is a quilter. He was pretty sure his mom would be very intersted in this story. It took a few hours between the interview & the photo shoot. Over the weekend the article was released. Well, she answered that yes, they always require that. I then asked her that if she must print my age could she also print that I already had my birthday this year??? If you want to know how old I am, you’ll have to read the article. Fortunately my photography isn’t good enough for you to read it here. I’m really enjoying the three blocks a day. It doesn’t hurt that they are cute little blocks, that are mostly blocks that I’ve not made before. 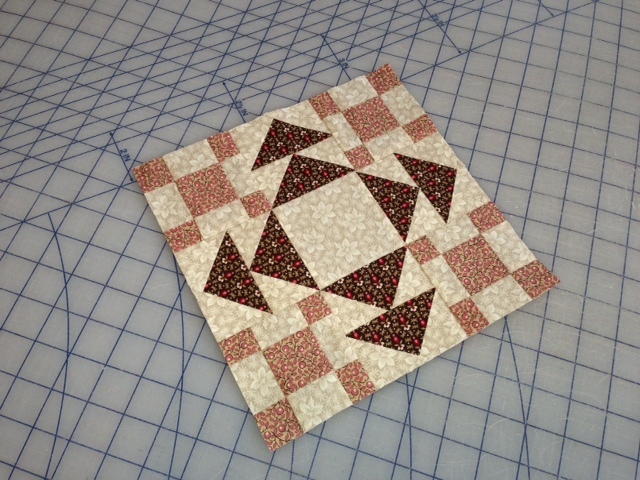 In particular, I’ve never appliqued a block before that was raw edge appliqued with no fusible web. 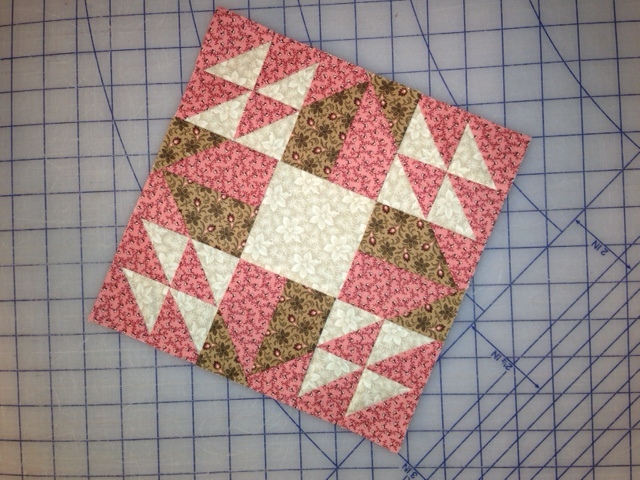 So far I’ve made two different blocks that way. This is block #18 by French General. 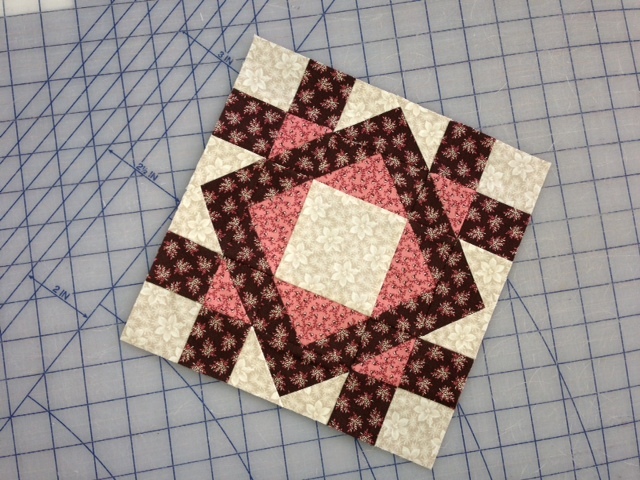 The other block was block #20 by Zen Chic. That’s one of the reasons I decided to do this Quilt Along. 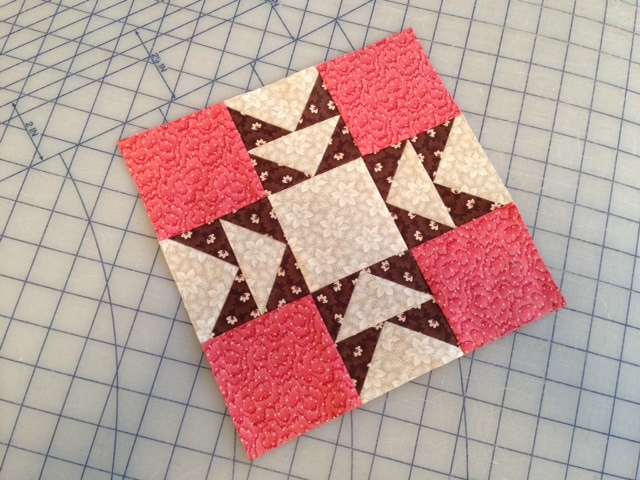 I’m sewing blocks I never would have made otherwise. 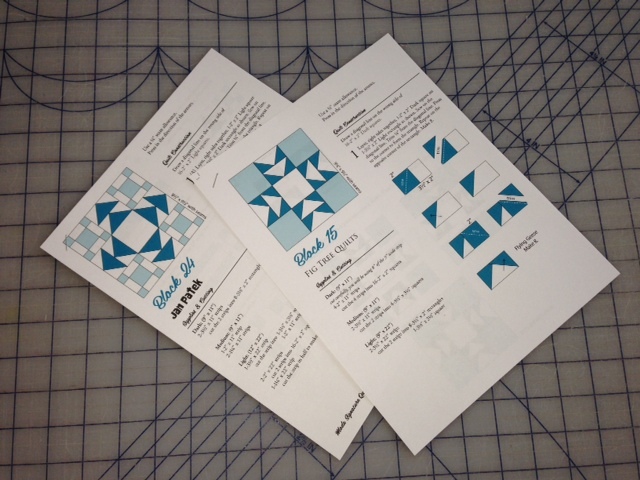 This is block #5 by Kansas Troubles Quilters. Block #10 by Kate Spain. I really like the fabrics that I chose for this one. They make the block very eye appealing. Well, that’s week #1 under our belts. We can take a break now. No new blocks until Monday. Or if you’ve not started yet, you have the whole weekend to get caught up with the fourteen blocks that I’ve already made! Day 4 only resulted in two patterns. 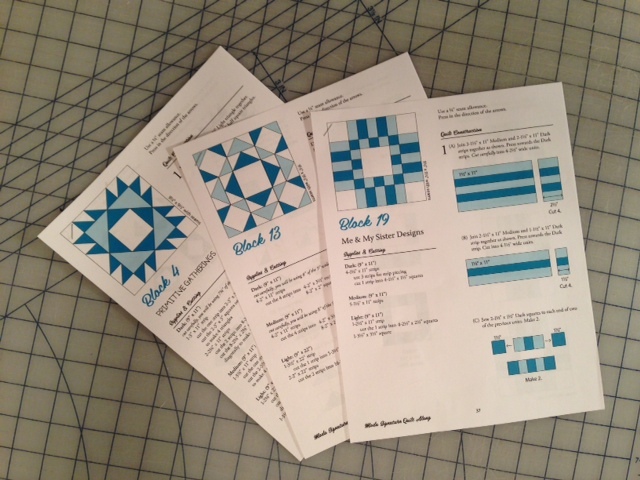 Block 15 by Fig Tree Quilts. Block 24 by Jan Patek. 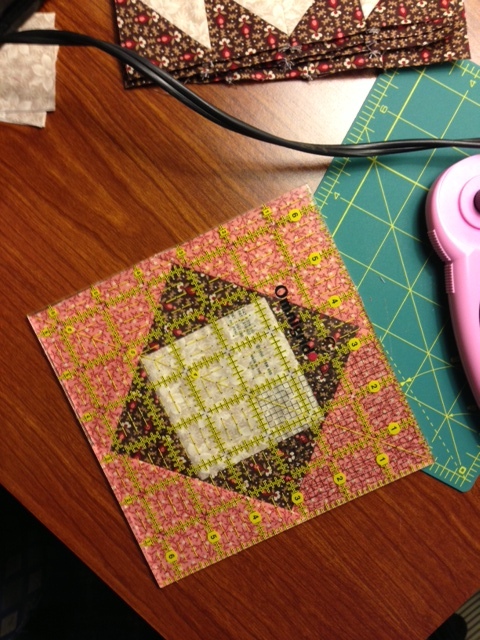 Jan is a master at applique and so she stitched a cute little house in the middle of her block. Maybe when I get the pdf I’ll add it to my block too. 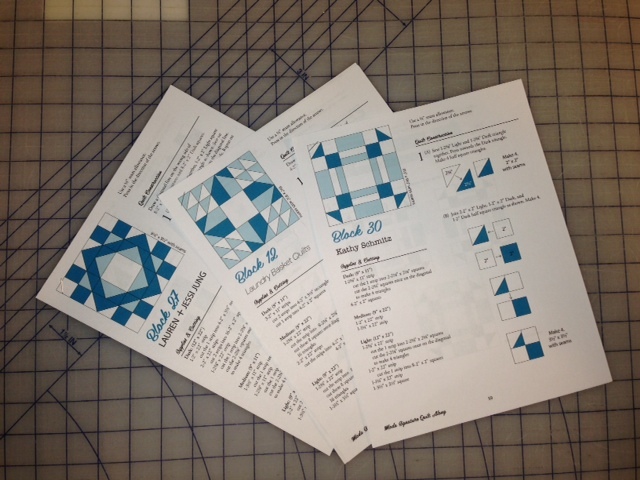 These blocks are quick when you already have the fabric choices narrowed down to just a handful. I can spend a lot of time belaboring that issue! 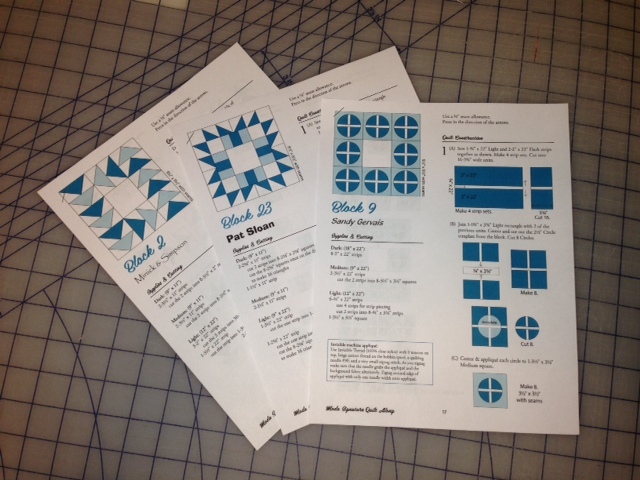 I also read the first three patterns and cut background strips of each size that I would be needing before I started sewing. The other nice thing that Moda did was use pieces of the same few sizes. 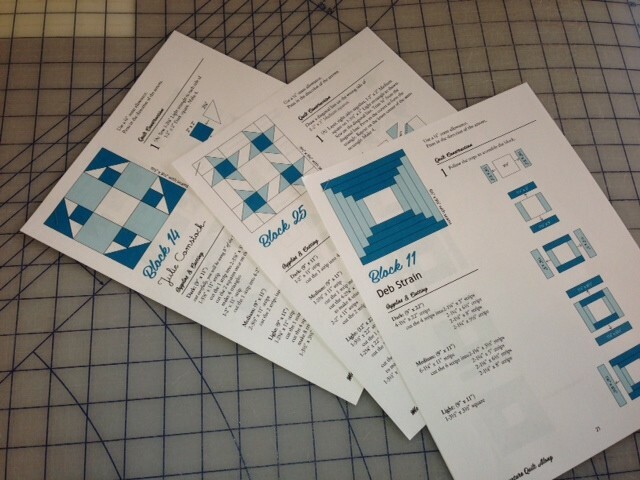 I keep going back to the 3-1/2″ strip and cutting off a few squares or rectangles. 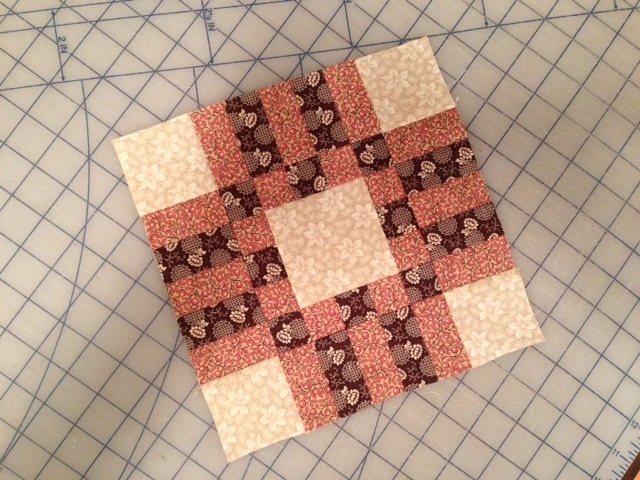 Then I cut a few more 2″ squares, etc. This really simplifies the cutting. Are you really not going to join in the fun? 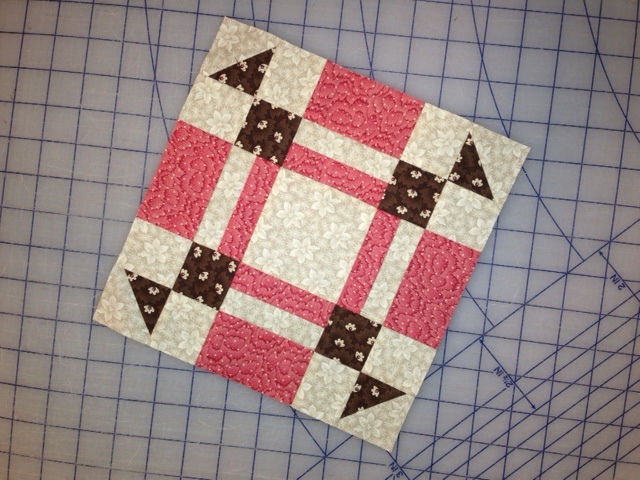 If you are sewing the blocks, send me your photos and I’ll post them along with mine. 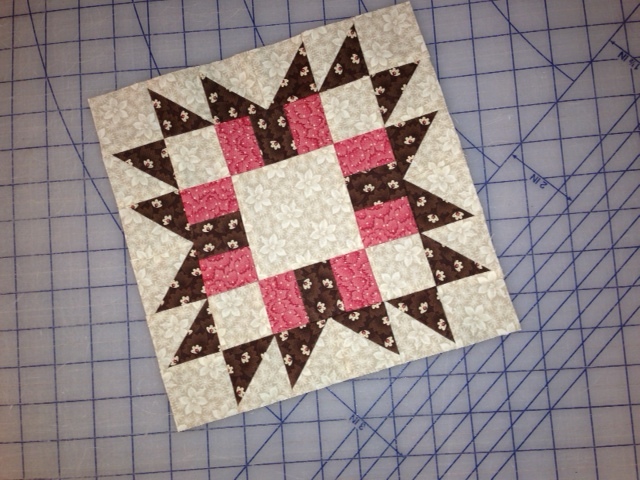 Day 3’s blocks were easy, and would have been quick, if only I had paid more attention..
Block 25 by Thimble Blossoms. 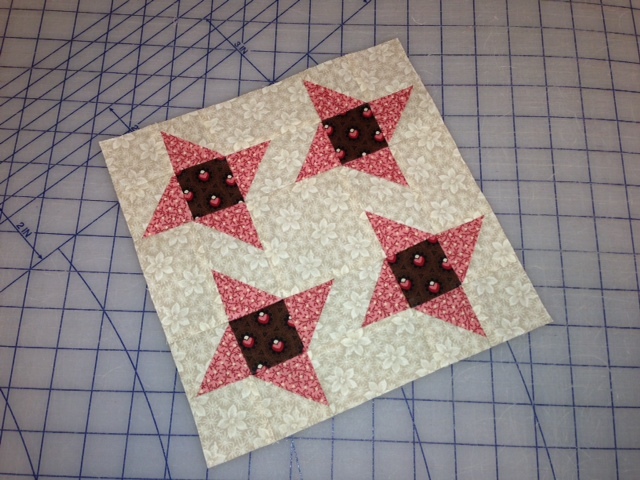 If you can tell, the brown fabric is directional and I wanted all of the squares going the same direction in my block. The rest of the exercise was great! 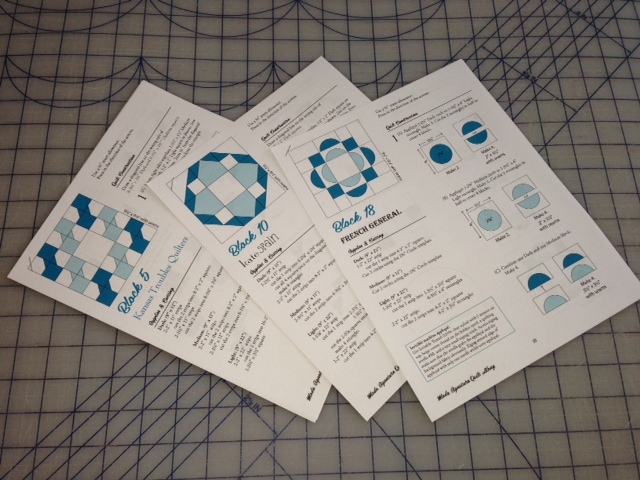 Block 14 by Julie Comstock. I had fun reading Julie & Eric’s post yesterday. Julie thought her day to post was tomorrow (today), but realized all too quickly in the getting-ready-for-school with their four children that her day was actually N-O-W. Apparently her block wasn’t even sewn. Her block was made lickety-split and by the second time I went to their blog it ready. Block 11 by Deb Strain. Have I enticed you to join me yet??? 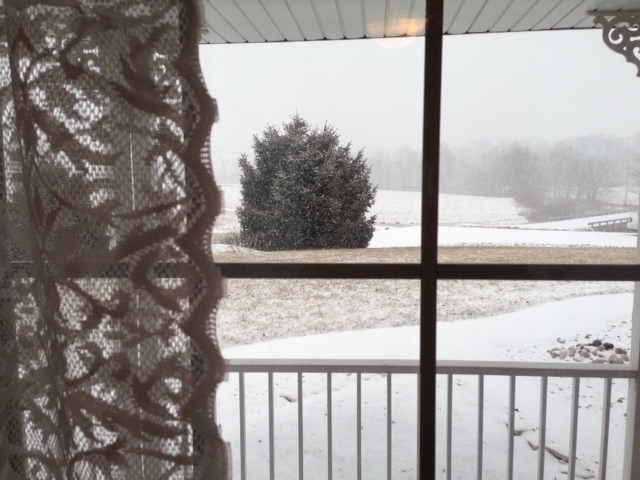 This is a view out of my sewing room. In about 20 minutes we already have an inch. A good day to sew don’t you think?